Full snow clouds in the sky. Ah...I love winter. Hot cocoa, snuggly pajamas and a time to curl up in a warm, cozy haven. The colder the better! Now, I say this because my home is in North Carolina, near the South Carolina border, and it usually doesn't get lower than the teens. If I lived in Minnesota or Maine I might have a different philosophy. This has been the first real flake fest of the year and it looks like it's going to stick around for a little while. 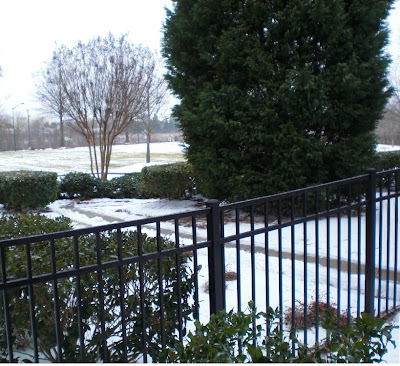 Our side yard is covered with a combination of snow, sleet and ice...but it looks so lovely! There's something about snow clouds...they seem to absorb all the noise of the hustle and bustle so we can truly hear what's around us. Cloudy days like today offer opportunities to take things slow and breath in the fresh, crisp air. So, while the snow is here I'll enjoy it and thank God for the white blanket of love He's sent our way. For now, I'll be on the sofa, sipping hot chocolate and watching old movies.